VIDEO: Center Director Dan Esty speaks about corporate sustainability in Latin America during an event at the Atlantic Council Global Energy Center. Learn about big ideas for sustainability from the Yale Environmental Dialogue. Listen to William K. Reilly discuss the federal government, environmental policy, and climate change. Read our four-part blog series about COP24. Todd Cort, lecturer on Sustainability at the Yale School of Management and Director of the Center for Business and Environment at Yale (CBEY), outlines the results of YISF’s research on corporate disclosure and sustainability disclosure for investors. Dan Esty recently spoke to Aspetuck Land Trust (ALT) this month about the important role local organizations and activists will play in protecting the environment. 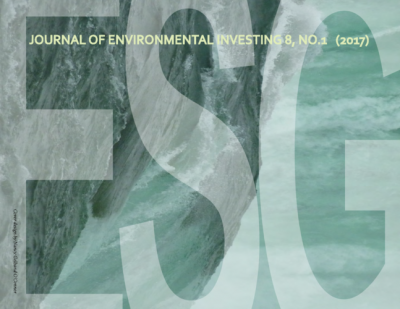 Last fall, YCELP helped launch a special issue of the Journal of Environmental Investing, focused on the state of environmental, social, and governance data and metrics. The issue was guest edited by our own Dan Esty and Todd Cort, Lecturer in Sustainability at the Yale School of Management. Esty and Cort’s introduction emphasizes the rise of sustainable investing in recent years, the accompanying need for standardized metrics, and the role those metrics may play moving forward.